A few years ago I worked with my brother on the exterior colors of his mountain cabin in Twain Harte, CA. Then I blogged about it. Turns out, this has become one of my most popular blog posts! And when Deanie from Oregon came upon the story, she did more than read it. She took those colors and painted them on her very own mountain cabin...with some pretty fabulous results. I had emailed you earlier in the summer about using your mountain cabin colors for a house we have in Bend, OR. I decided to go for it and I couldn't be happier! We needed new siding and we decided to push out the front porch too. While looking for color inspiration I came upon your post and was sold! The house needed to look more like a mountain cabin and less like a unmemorable suburban house. The builder working in it was extremely hesitant, but I was confident! He now has changed his tune and loves the colors! Here is the before and I'll send the after... Thanks again for your inspiration!!!" I think it's kind of fun to see the same colors applied to a different structure! I also thought it'd be fun to ask Deanie a few questions on her paint selection process. I sent her a long list and she was kind enough to answer my questions thoroughly and thoughtfully. Thanks, Deanie! Q} How long have you owned your cabin? We bought the house about 8 years ago and we rented it out yearly for the first 4 and we've used it for ourselves as a vacation house for the past 4 years. Q} What prompted the new paint job? The house was built in 1993 and is a pretty standard "suburban" type house...not very interesting architecture at all. We needed to replace some damaged siding on two sides of the house and the house needed painting also, so we thought it would be a good opportunity to make some other exterior changes. Q} What were you hoping to achieve through color? Q} Was it difficult to find a palette? Yes!!! We worked with a builder who was helping us with the design elements like adding the cedar shingles on the top gable, adding braces, and enlarging the front porch. I'm sure in his line of work, it is better to go safe, but safe would have defeated some of the purpose of this project....completely changing the look! He was trying to steer us very safe with very neutral, I thought boring, colors. I had first been thinking of a cottage red, but I ended up thinking the house is a little too big and didn't have the right architecture for a cottage red. Q} What process did you go through to find the "right" colors? I have a Benjamin Moore color wheel that I've had for years and I've used for the interior of the Sunriver house and my house here in Washington. I pretty much carried it with me and drove around neighborhoods I liked comparing colors. I spent a lot of time on Houzz looking at cabins and craftsman type homes looking at their color selections. I also bought about $150 worth of samples from Benjamin Moore and had a big piece of plywood in the garage that had all my choices on it...but I still wasn't really inspired by any of the colors. Q} What eventually led you to my blog post? What was it that intrigued you about this particular color palette? I knew I wanted to go dark and rich for the colors and felt that it would make the house feel more substantial and give it more character. Besides Houzz I hadn't looked online and didn't really know where else to look. Then I just thought about what I wanted the house to look like and even thought it didn't look like a mountain cabin now, that is what I wanted it to look like, so I just typed into Google "Colors for a Mountain Cabin"...and I think your post was the first thing that popped up! And WOW! I knew it was perfect right away! I showed my husband and he really like it too! We really wanted some cedar accents and so the front door was also exactly what we wanted too! And since I had the Benjamin Moore paint wheel, I could look at the colors right away and I went down and got samples. The interior is all Benjamin Moore too, Solitude (blue/gray) on a couple of walls and Pale Celery (soft creamy yellow) with red and green accents, so I also was excited about how the exterior would complement the interior. Q} You had some initial resistance from others to the color selections. What were the big warnings and fears? I brought the paint samples down to Sunriver in July and painted one big section and of course next to the faded, washed out gray/blue that the house was, the French Beret looked REALLY dark! As I said, the builder wasn't confident and seemed to be afraid that with the Hot Apple Spice trim was going to make it look "gingerbread-ish". He was still trying to steer us toward tans and beiges. Q} What made you eventually "go for it"? How did you find the confidence to trust yourself? And we were paying a lot of money to make the house look very different, I would have been disappointed if we had paid all that money and just have it look a little different, so I just thought "What the hell...Go for it"! The builder absolutely LOVES the colors - the neighbors LOVE it, and we LOVE it! It achieved exactly what we wanted! The house looks like a mountain cabin now! The colors are rich and masculine and fit so well with the neighborhood and with the dark green evergreens and the rusty, red volcanic dirt of the high desert area. Q} What would you recommend for others who are searching for the perfect exterior colors for their mountain cabin? That you go outside of the box for a mountain cabin. I wouldn't have painted my house in Washington those colors. We have a farmhouse style house here with dormers and a big covered front porch. The house is white with green trim and fits perfectly the type of house it is. With a cabin, or a house that you are trying to make look cabin-ish, I really like the dark, forest-y colors that actually blend in better than light colors in those surroundings. Here's my brother's cabin in Twain Harte, CA. Twain Harte is a cute little mountain community in the Sierras named after Mark Twain and Bret Harte. It's a three hour or so drive east of San Francisco and has a population of about 2,500 people. My brother and his partner purchased the property about two years ago and have been steadily working on the project, making it their perfect mountain getaway. Although there was originally an old cabin on the property, they unfortunately had to tear it down and re-build. It was too decrepit to salvage. However, they paid homage to the original cabin design with their new construction, and did at least manage to keep the back house (which will eventually be transformed into an in-law unit) as well as some knotty pine that will be repurposed for interior wainscotting. Naturally, when the time came to select colors for the house, I was bribed into helping. (My brother's a trained chef, so he can always successfully bribe me with a good home-cooked meal.) I had never consulted on a mountain cabin before, but was up for the challenge. You start by asking lots of questions. I verbally guided both of them through a polarity profile, which is basically just a way of measuring and assigning meaning to a structure or space. Did they want their cabin retreat to feel Happy or Sad? Friendly or Aloof? Open or Private? Formal or Informal? Vintage or Modern? Masculine or Feminine? Then I had them each write up a list of characteristics that they wanted the cabin to have. They were not to discuss with each other - I was very strict about that. Fortunately, I had their complete cooperation and we ended up with two lists that were VERY similar. They wanted private, vintage-y but not kitschy, masculine, and "mountain-y." The purpose of doing a list of desired characteristics is to help eliminate certain colors. Once you know that a color or color combination needs to be masculine as opposed to feminine, you can wipe out a ton of options. You probably aren't going for pinks and pastel anything. And private, in this instance, meant that we didn't want to draw a ton of attention to the structure. We wanted to have the cabin settle in to the deep browns and greens of the trees and earth. The vintage-y part was a little trickier. Vintage can mean different things to different people. This is where I dumped a ton of 8x8 paper paint samples on the table and asked them what they liked. (I've learned that this process doesn't work with most clients. It's just too overwhelming. Since we've worked together on colors before, and it was family...AND it was a free consultation...I knew this approach wouldn't send them running for the door.) As we poured over the paper color samples, we determined that vintage-y meant a reference to their collection of American Arts and Crafts pottery - simplified, well-made, deep, rich and bold with a subtle flair. After determining that a deep color was the way to go, we just had to figure out which deep color...and what would the trim be? As we pulled color samples, we took each of them outside in the sunlight. It wasn't the exact lighting we would have up at Twain Harte, but at least we were dealing with a single light source, the sun, which is much more predictable than interior lighting conditions. We pretty quickly eliminated the green color family because there was already a preponderance of green with the surrounding trees. Not to mention, the neighbor's house across the street was green and we wanted a little more originality. After exploring violets and reds and browns, we eventually made our way to deep and somewhat muted blues, which resonated well with my "clients", supported their desired characteristics for the structure, and ultimately, their own personalities. We finally settled on French Beret, a deep blue-grey by Benjamin Moore for the body of the house. And for the trim we went with a more traditional cabin color in the red family, Hot Apple Spice. And just because we wanted to make things more difficult, we opted for a third color on the underside of the roof. Well, it wasn't really to make things more difficult. It just didn't feel right to use either the red or deep blue-grey. We wanted to lighten the visual weight the color that would be overhead when you're sitting on the porch. But, it did turn into an opportunity to make the exterior color scheme more complex and, I think, interesting. Unfortunately, I don't have notes on the exact color, but it's essentially a medium muted green/brown. Kelly Berg is an interior designer, color expert and writer based in the San Francisco Bay Area. 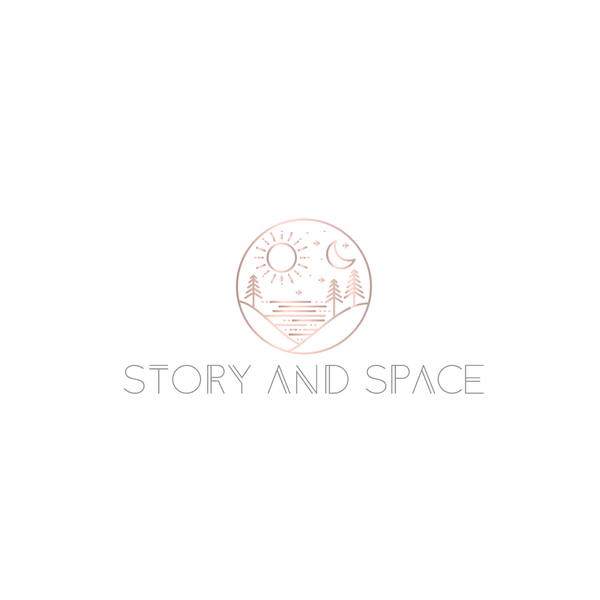 Her company, Story & Space, offers specialized design services with an emphasis on color, environmental psychology and storytelling. Introducing Vegan Interior Design Services! ©2019 Kelly Berg | Story and Space. All Rights Reserved. United States.